A fire on Saturday destroyed a Muslim-owned clothing store in a district of Sri Lanka where religious tensions have been heightened after anti-Muslim riots killed four people and wounded 80. 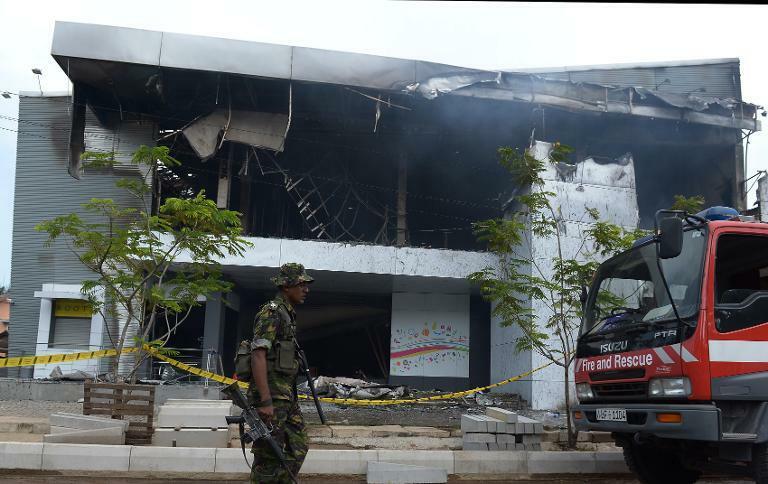 Sri Lankan police were investigating the cause of the blaze which Justice Minister Rauf Hakeem, the most senior Muslim in President Mahinda Rajapakse's cabinet, described as an arson attack. 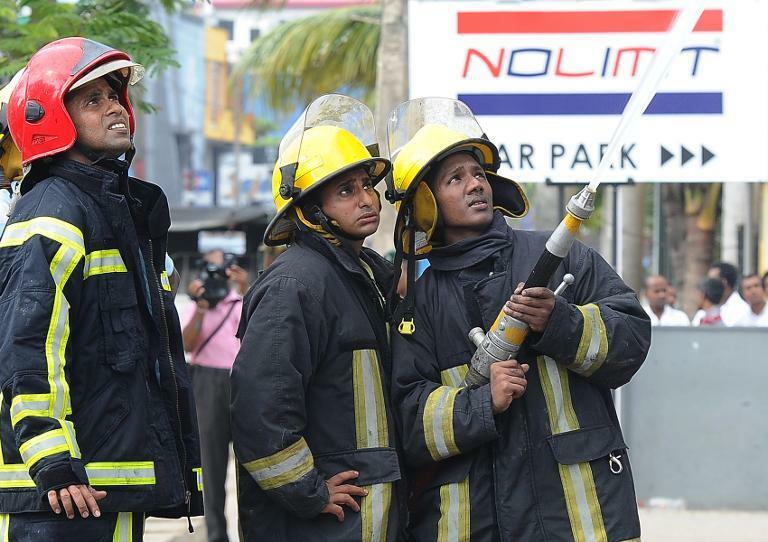 He said the fire at the "No Limit" clothing store in Panadura, 25 kilometres (16 miles) south of the capital Colombo, was the latest attack against Muslims, who account for about 10 percent of the 20 million population in the mainly-Buddhist country. Hakeem blamed the government for failing to control a hardline Buddhist group widely blamed for riots on Sunday and Monday that also destroyed hundreds of homes and shops. "Irrespective of who is responsible for the terrible events that unfolded... none would dispute that it was a serious dislocation of the ability of the state to maintain the rule of law," Hakeem said after an emergency meeting Saturday with Rajapakse. Hakeem, who is under pressure from his minority community to resign over the government's failure to deal with the unrest, called for an independent investigation. The President said he was ordering a probe into "recent disturbances". "I will be appointing a high-level panel to inquire into recent disturbances," the President said on Twitter. In a separate pre-recorded message released to reporters, Rajapakse also accused unnamed "foreign forces" of stirring unrest to destabilise his country. "Foreign forces which have tried to destabilise our country are behind attempts to stir communal and religious unrest," he said without naming anyone. Police said Saturday's fire was under investigation. "We are looking at the possibility of arson as well as an accidental fire," police spokesman Ajith Rohana told AFP. "The fire started in the upper floor and we are still investigating." Police said workers had carried out some electrical repair work at the No-Limit store the day before the blaze. There were six people at the store, including two unarmed guards at the time of the pre-dawn fire. Witnesses said they heard several explosions as the fire completely gutted the two-storey building. The blaze came a day after Sri Lanka's Muslim minority shortened their Friday prayer services because of heightened religious tensions after clashes with hardline Buddhists earlier in the week in Kalutara district. The district includes Panadura, and the popular and mainly Muslim coastal resorts of Alutgama and Beruwala, where religious riots earlier in the week led to two days of curfews. The Muslim Council of Sri Lanka said Islamic clerics instructed mosques to conduct shorter services and asked the faithful to disperse peacefully after lunchtime prayers on Friday. Muslim-owned businesses shut down in Sri Lanka's capital Colombo on Thursday to protest against the riots by extremist Buddhists, defying Rajapakse's plea to stay open. In March last year, two Muslim-owned clothing stores, including No-Limit, came under attack from Buddhist mobs. Colombo is also facing criticism over its failure to protect religious and ethnic minorities five years after defeating Tamil rebels who fought for an independent homeland in the island's north-east.